Moist and soft vanilla cupcakes with a very vanilla buttercream frosting. These moist and fluffy cupcakes are packed full of delicious vanilla flavor. The trick to getting moist and fluffy cupcakes is to not overbeat the cupcake mix when adding in ingredients. Overbeating creates a dense cupcake that isn’t airy or fluffy. Using a hand mixer on low to slowly beat to just incorporate the ingredients is key to making these vanilla cupcakes. I used egg whites only in this recipe to help reach the level of fluffiness I wanted in a cupcake. It also makes these cupcakes whiter than if I were to use whole eggs. Using yolks in this recipe would have made a more velvety texture as well as added more fat to the recipe. If you want to use whole eggs in this recipe, use 2 whole eggs instead of the 3 egg whites. It will change the texture a bit and will be a little heavier because of the added fat but it will still be good! 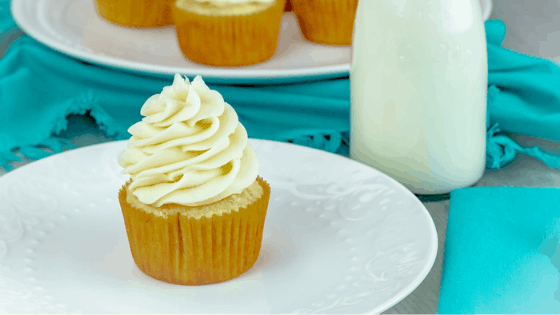 This buttercream has a rich vanilla flavor that truly makes this cupcake a vanilla cupcake. I use real vanilla in my recipes so the flavor is authentic but you can use imitation vanilla if you would like. Most recipes call for 1 teaspoon of vanilla but I used 2 teaspoons in my recipe so that the frosting would have a more intense vanilla flavor. I always add milk as needed, only adding 1 tablespoon at a time. If for some reason you add too much milk to your frosting and it becomes too soft add 1/4 cup of powdered sugar to the mixture to help create a stiffer frosting that is better for piping. Moist vanilla cupcakes with a very vanilla buttercream frosting. Line muffin tins with 16 cupcake liners. Start by adding sifted flour, baking powder, and salt into a medium-sized bowl. Blend well. In a large bowl, beat together the softened butter and sugar until well combined. Slowly beat in the egg whites. Beat in the vanilla, sour cream, and milk. Do not overbeat. Slowly add the dry ingredients into the wet ingredients until combined and blended. Be careful not to overbeat. Bake in the oven for about 14-16 minutes. Check center of a cupcake for doneness. Remove from oven, let cool for 10 minutes before moving to a wire rack to cool completely. Beat the softened butter until smooth. Slowly add in the powdered sugar until it is all mixed into the butter. It will be clumpy. Add in the vanilla and blend. Add in 2 -3 tbsp of milk or as needed to create the desired consistency for frosting. To pipe the cupcakes, you will need a stiffer frosting to hold shape.